Today's Weapon comes from Japan, at least I am pretty sure anyway. I am calling these the Weapon Extra High. 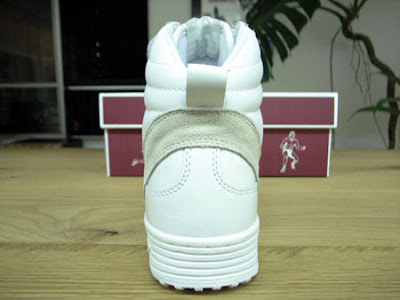 These work really well in this clean white leather/suede upper. 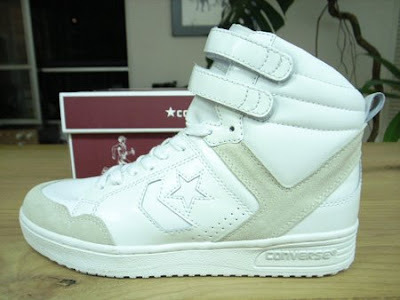 They feature two straps around the extra high top upper. They also threw in a heel tab for good measure. And as you can see in the back ground they also come with a nice retro inspired Converse box. 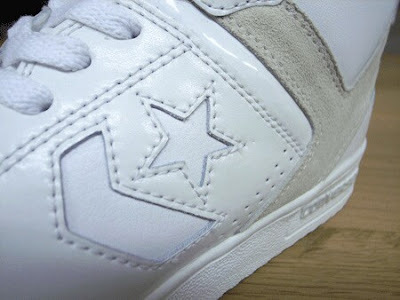 That's all for Weapon Wednesday, but check back on Friday for another Friday Flashback here at the Converse Blog. Also I am looking for a good idea for a new poll for the blog, so sent me over your ideas and I'll get one of them up soon.